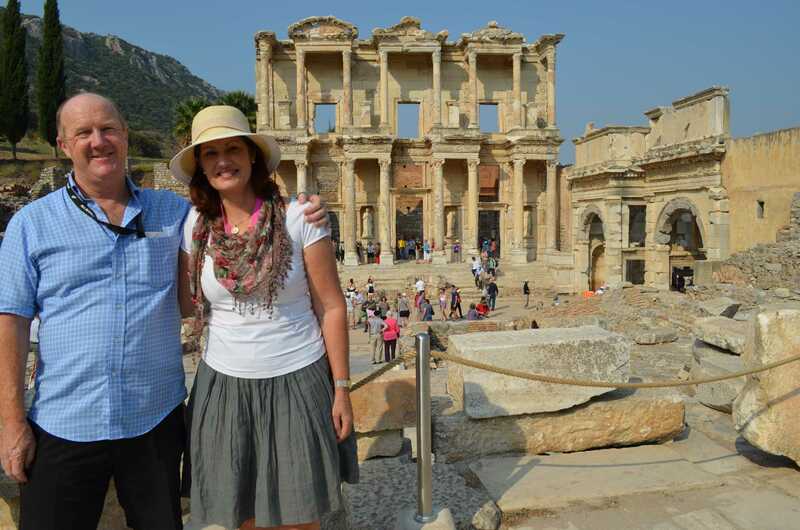 Now we have reached the library of Ephesus. 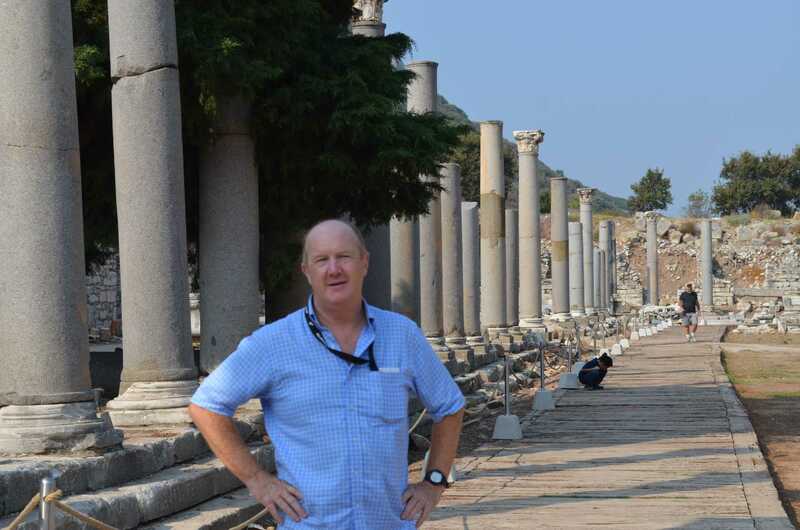 Some scholars estimate the number of people living at Ephesus to have exceeded 250,000 inhabitants during Ephesus III, which would make it perhaps the fourth largest of its day behind Rome, Alexandria and Antioch. So it is not surprising it had such a large civic building. 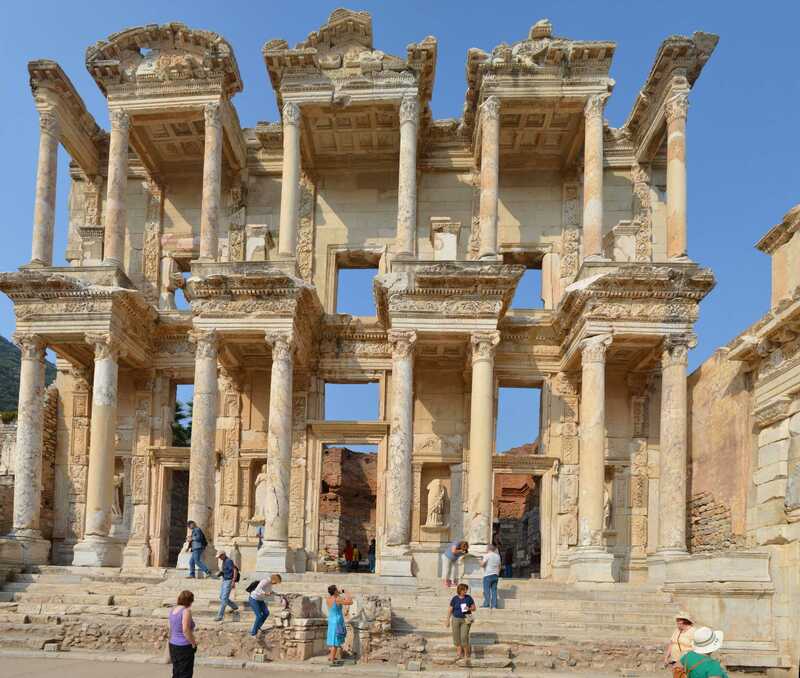 This library is one of the most beautiful structures in Ephesus. 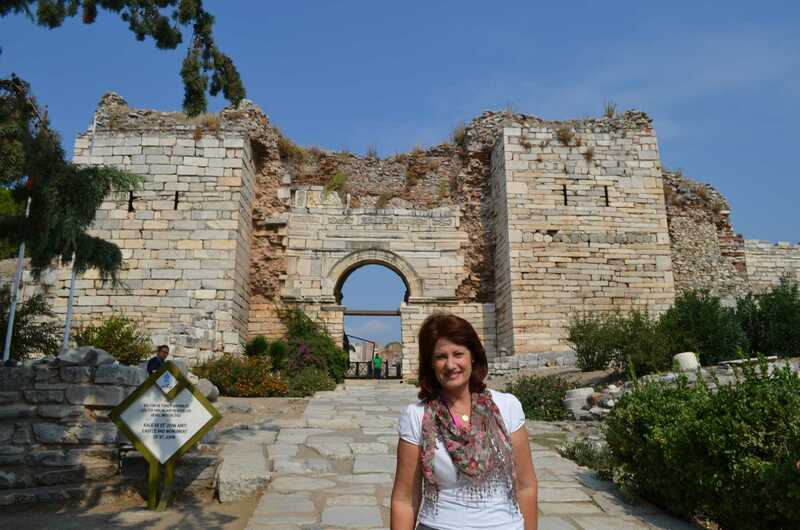 It was built in 117 A.D. It was a monumental tomb for Gaius Julius Celsus Polemaeanus, the governor of the province of Asia by his son. 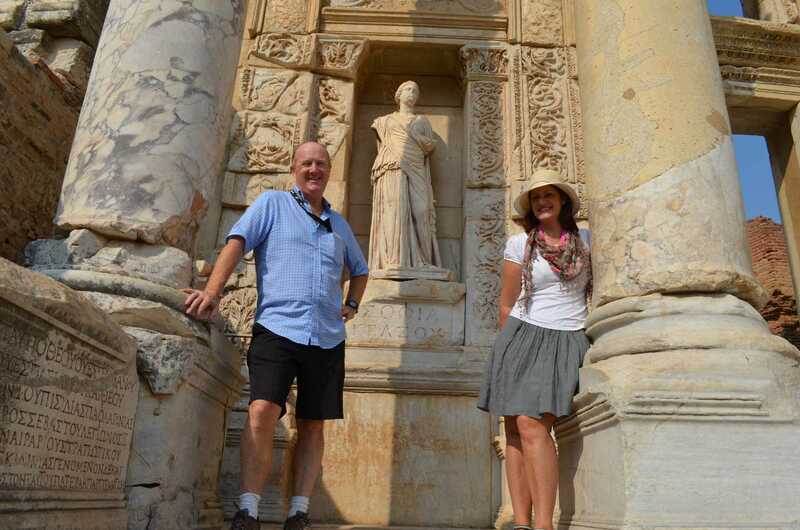 The grave of Celsus is beneath the ground floor, across the entrance and there was a statue of Athena over it. Because Athena was the goddess of the wisdom. 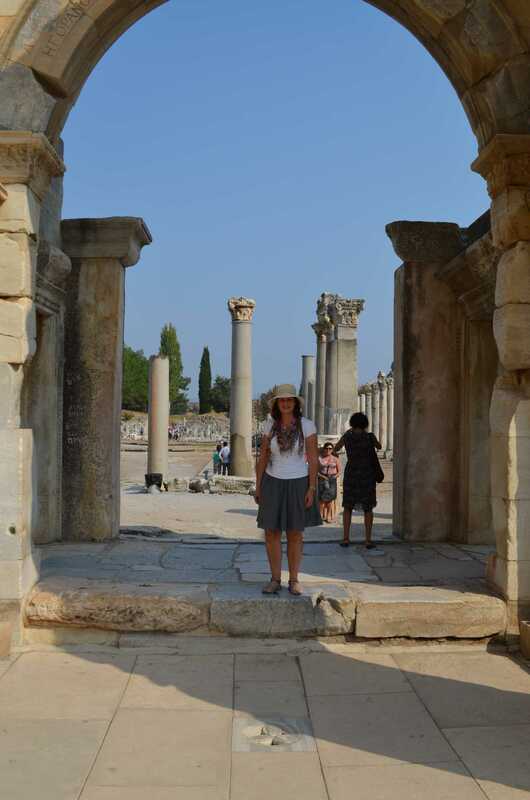 Most amazing of all, the remains of Celsus are still in his sarcophagus, and the sarcophagus is still in its original resting place in the crypt under the library apse. The scrolls of the manuscripts were kept in cupboards in niches on the walls. There were double walls behind the bookcases to prevent the them from the extremes of temperature and humidity. The capacity of the library was more than 12,000 scrolls. It was the third richest library in ancient times. 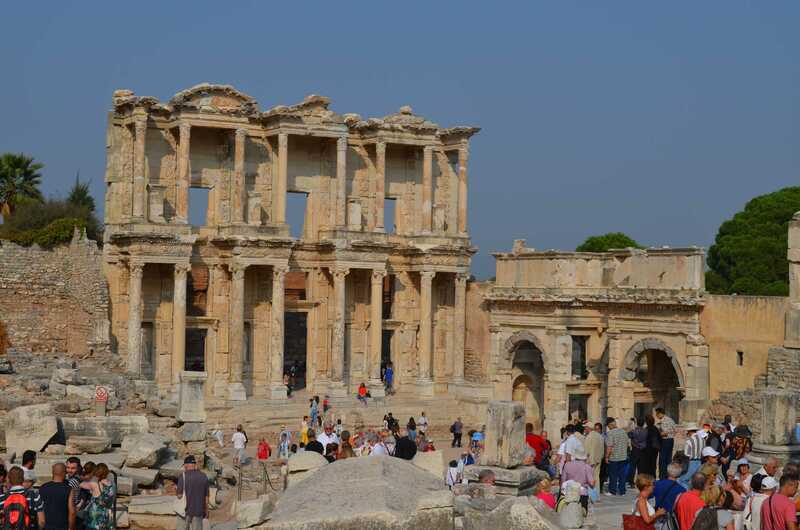 To put that in perspective it is believed that the library of Alexandria held 400,000, Pergamum 200,000. 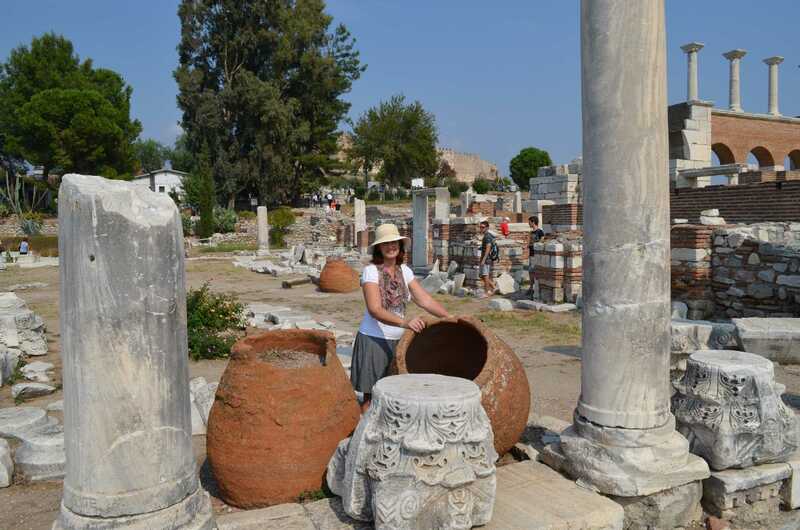 It was just astonishing to see just how much material they have recovered. Is supposed to enable those who cannot read Latin to find local business in the city. This advertisement is known as the first advertisement in history. There is a footprint on the advertisement, one finger showing the library, and other showing the brothel. The known explanation of this sign is that the footprint shows that one should turn at that point; the woman’s head symbolizes the women waiting in the Brothel and the heart shows that the women are eager for love. 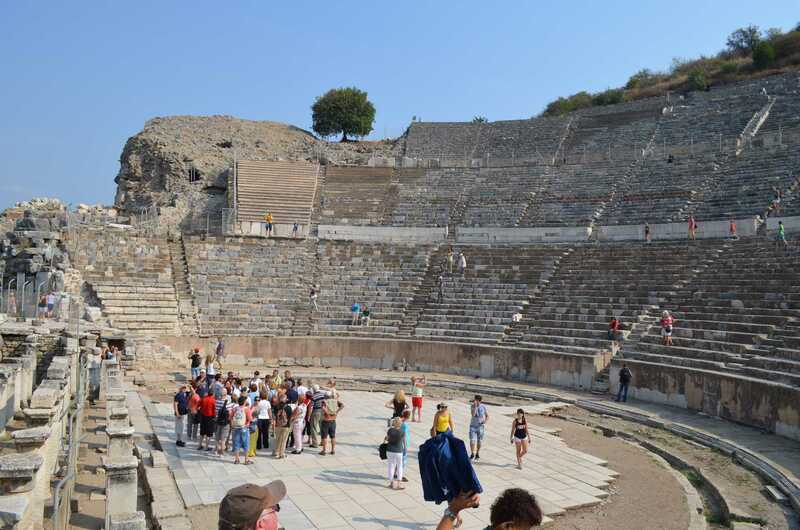 The Grand Amphitheater had a capacity of 25,000. Elton John and Sting have both performed here. The tunnel where performers would exit and gain entry to the main stage in the amphitheater. And this astounding road behind Judy used to lead to the sea and the wharf. The sea is now 8 KM further away because of silt build up by the Cayster River . 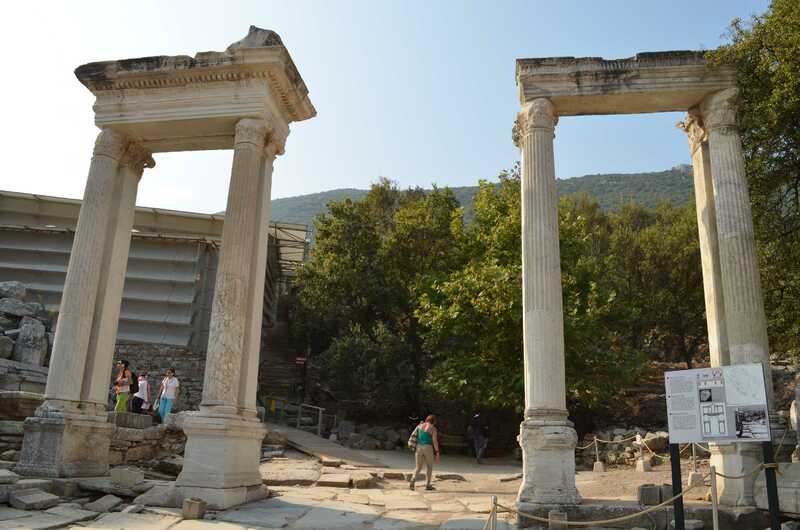 Between the silt build up and the great earthquake of 614 AD Ephesus fell into ruin. 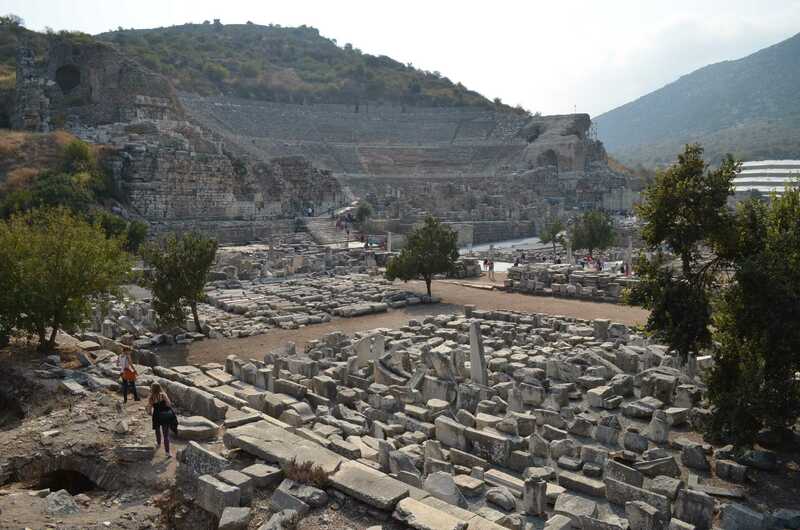 I have to show you this photo of the Grand Amphitheater as it shows the 100’s of tons of ruins lying around. 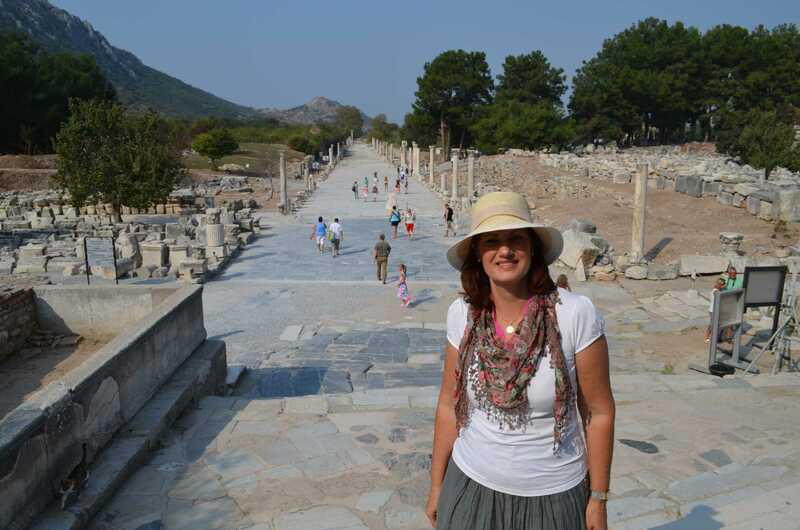 We had nearly 3 hours of walking around the ruins and to be honest it was our guide who hurried us along. All of us were enjoying just being there so much. 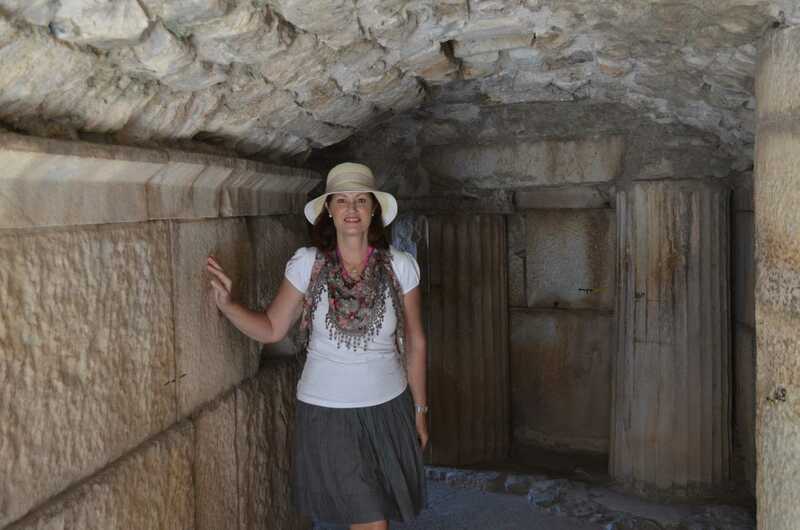 But we had to move on and the next stop was the church and tomb of St John. Inside was like no other church I have been in. 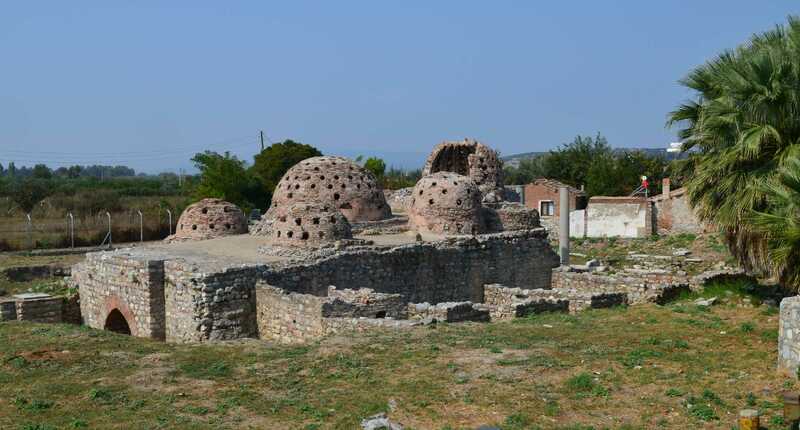 It was modeled after the now lost Church of the Holy Apostles in Constantinople. As the story unfolds, the following Sunday, St. John continued with his preaching of Christianity before finally informing his disciples of his time. Then he entered the cave of his church whereupon an intense light shone, preventing his disciples from entering farther. When the light dissipated, so did St. John. 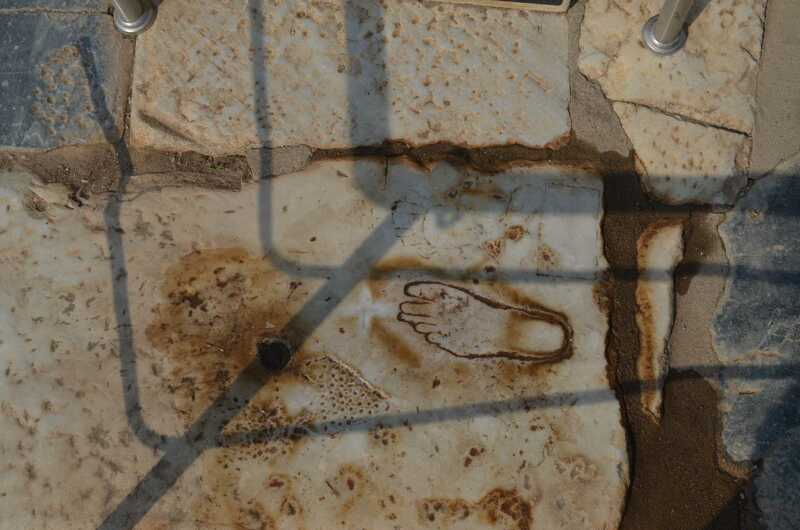 His legend was furthered when the opening of his tomb during Constantine’s reign yielded no body or relics. 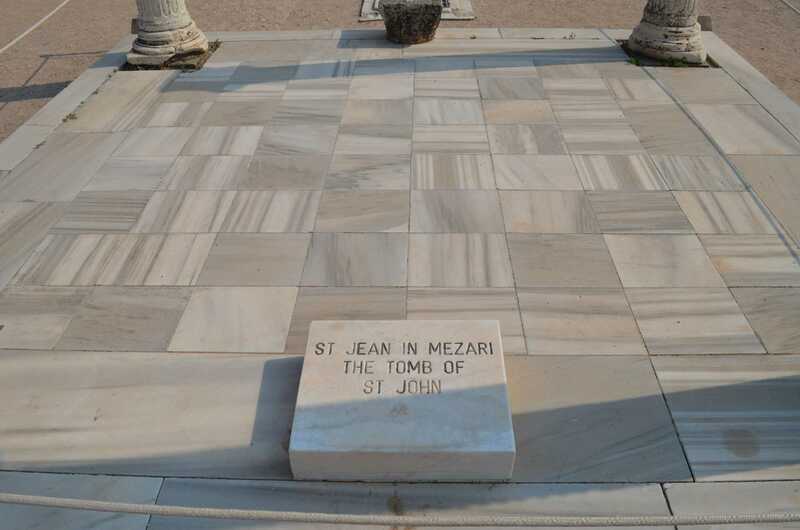 Another fact that continues to advance the legend of St. John’s ascension to Heaven is the fact that while all the other Saints’ body or relic has been claimed by at least one or more city/church, St. John is the only Saint whose body is not claimed by anyone or anywhere. 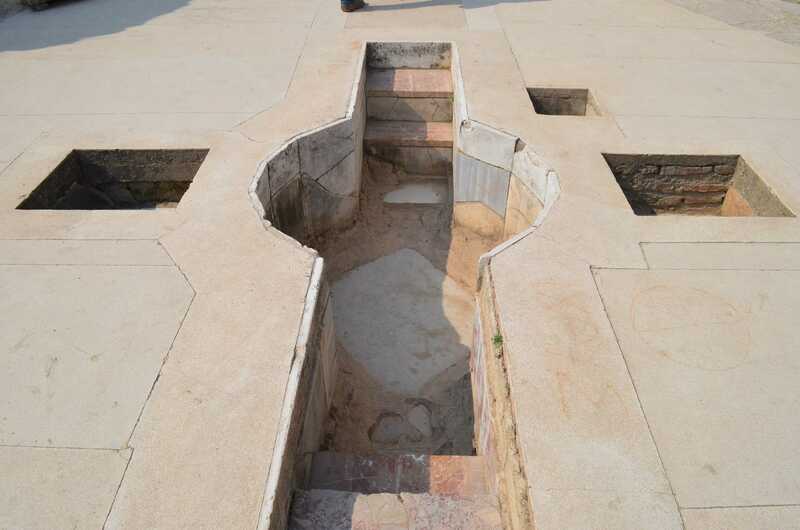 You might then ask why do they have this tomb? Walk in one side, get dunked and walk out baptized! 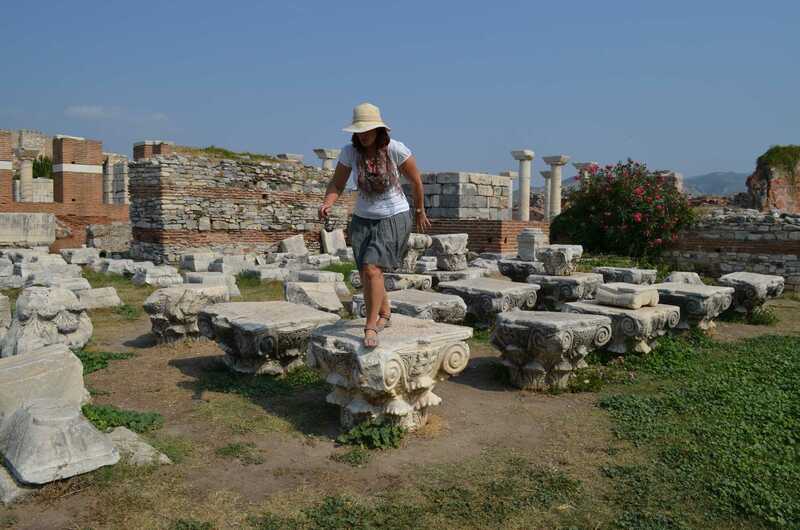 I asked Judy to hop up on some old stones lying about but before I could take her picture the local guard ordered her off! Not sure why, there just lying around! 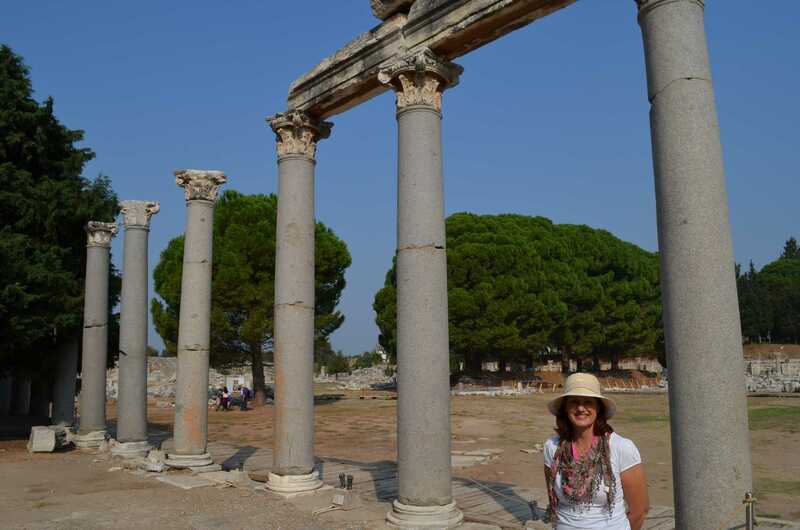 Our final stop is the temple of Artemis, one of the Seven Wonders of the Ancient World. This is how it used to look. This is how it looks today with Judy in front of it. 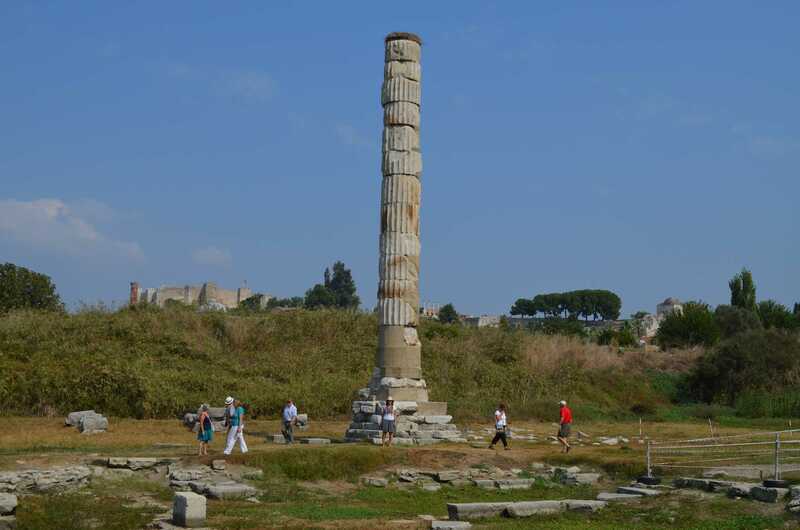 The Temple of Artemis (Artemision) was the first to be entirely of marble and one of the largest Greek temples ever built, measuring some 377 feet in length and 180 feet wide (larger by twenty feet on a side than a football field). 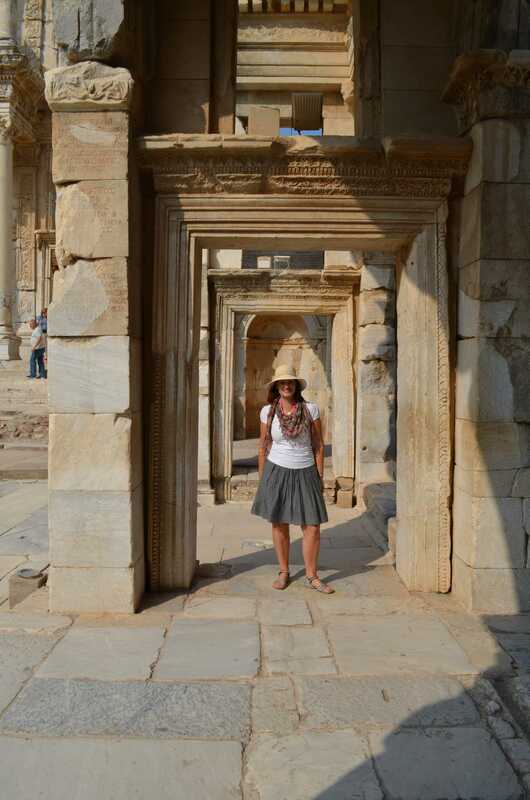 The temple had 127 columns, each sixty feet high. 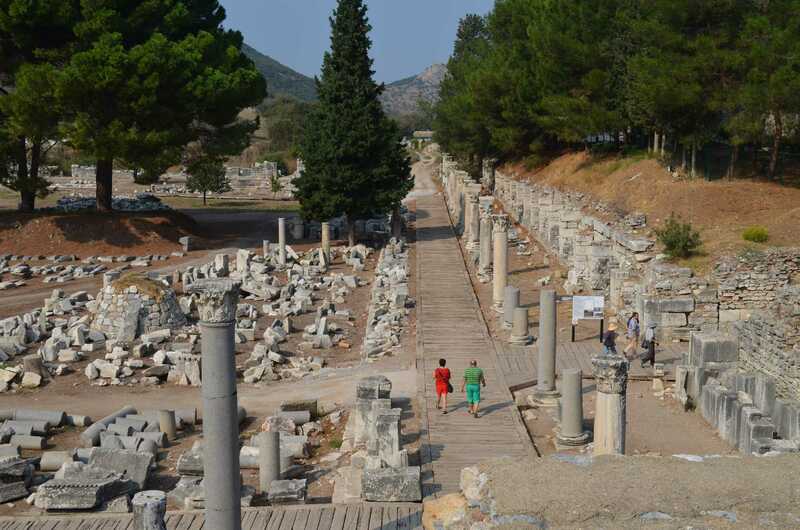 Thirty-six of these columns, were carved with reliefs, one of them by Scopas, who also worked on the Mausoleum at Halicarnassus (another of the 7 Wonders of the Ancient World). The temple had taken one-hundred twenty years to complete. A variant reading indicates two hundred years, which is the approximate time from when construction of the temple began (about 560 BC) to its destruction in 356 BC. 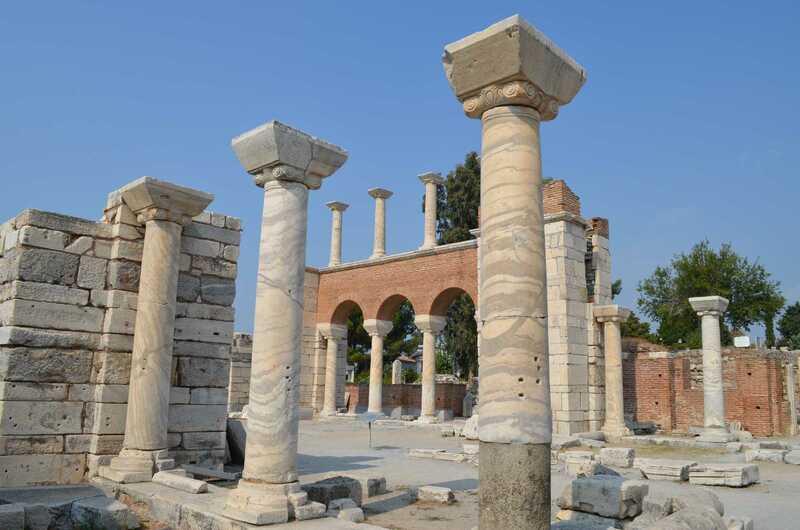 On the night when Alexander the Great was said to have been born, the temple was deliberately burned down by Herostratus, who, setting fire to the wooden frame of the roof, hoped to immortalize his name. 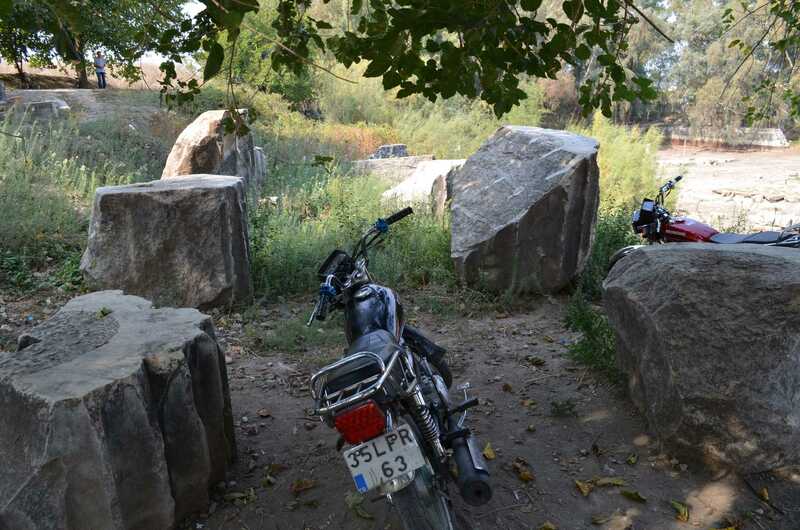 And today people park their motorbikes among the ruins of the columns. Does it not want to make you cry how much beauty we have lost. After a free lunch we returned to the boat. 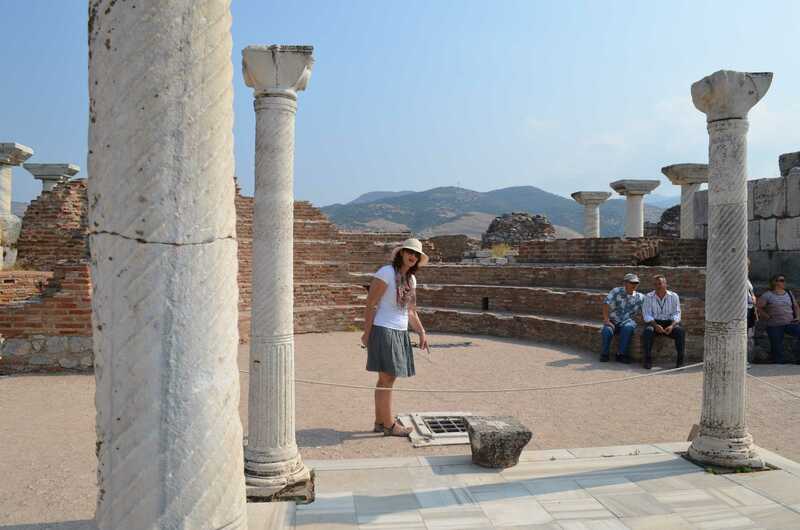 This was definitely a great day and I would happily return to Ephesus for another look. 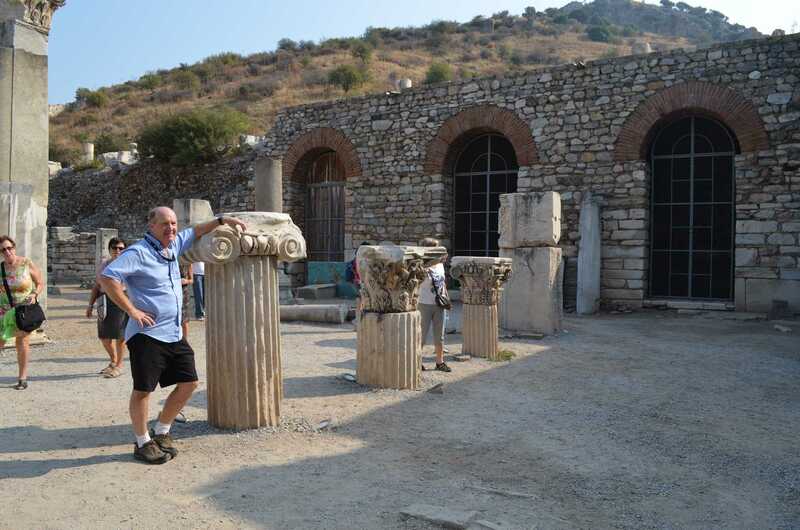 This entry was posted in Daily Blog and tagged Artemision, Ephesus, Grand Amphitheater, Hadrian, Library of Ephesus, St John Tomb, Temple of Artemis, Turkey. Bookmark the permalink.